I'm finally getting more of my e.l.f. review videos up! Here's the first of many to come. Let me know what e.l.f. products you would like me to review next! Click here if you would like to see my Massive ELF Haul video! 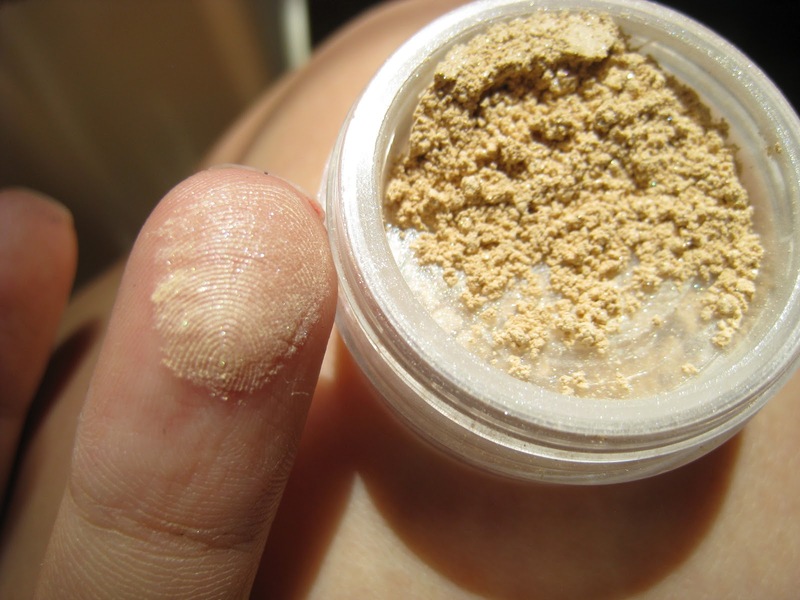 Here is my ELF Mineral Eye Brightener Review...leave questions in the comments below! Can you tell which eye was "brightened"? My finished face :) A soft, natural look...as per usual. Influenster sent me this Radiant pack to test and review, but I haven't got a chance to test it out yet. I just keep it in my purse for... the emergency! Quick Take: The pack comes with pads and tampons! yay and the packaging is really cute. The Verdict: I can't wait to try the products and I love having this little clutch to carry around. It is discreet and compact and does it's job! Though I haven't tried these particular products yet, I have tried other Always and Tampax items and I think they, as companies, are very forward thinking and always come out with new innovative feminine products. They are a reliable company and have made many reliable products so I'm fully confident I will like these products and so will you. Visit Always and Tampax to learn more about these new products they're launching! Yes, it's another haul everyone. I'm not usually a shopaholic, but I have been purchasing lots of bargain dresses lately! Especially from Forever 21. Watch my YT video below to see what I bought and please "like" the video if you want to see more hauls. I hope you all are having an awesome Saturday! If you do not have the red/blue 3D glasses, it's ok! ...for the best quality :) Enjoy! Hello! So I'm so excited to tell you guys about this new product I've been trying out. It has definitely become one of my new staples for the summertime! The product is called Hawaiian Tropic Silk Hydration Lotion Sunscreen. Influenster sent a sample of this product to test and review and I fell in love with it! I even went to Walmart and bought a full sized bottle of it. Also available in SPF 12, 30, 50! With its ultra-luxurious hydrating silk ribbons, Hawaiian Tropic Silk Hydration™ lotion sunscreen nourishes and pampers skin while providing broad spectrum UVA and UVB protection, and 12-hour moisturization when out in the sun. You can find Hawaiian Tropic products at most major retailers. I had a feeling I was going to be obsessed with this product because I love anything related to skincare and sun protection...and guess what, I love it! Quick Take: I really liked the packaging and how you could visibly see the hydrating silk ribbons flowing throughout the product. It also has the most perfect summery better-than-sunscreen smell which I adored. Usage Tips: Apply liberally! This lotion sunscreen smells so beachy, you'll gladly want to! The Verdict: This product lived up to my expectations. It was definitely hydrating to my skin...not sure if it lasted 12 hours, but it lasted the day. It left my skin feeling soft and did not have an uncomfortable residue that other creamy sunscreens leave on my skin. I love that the lotion sunscreen ranges in SPF, but I'm not in the sun for long periods of time so SPF 30 was perfect for me. All and all, I thought this was a product that performed well and smelled like vacation! I definitely recommend it! 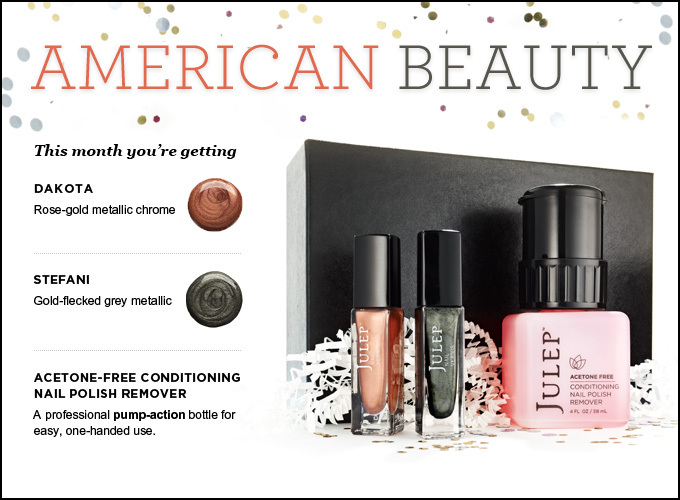 I not an avid user of metallic and chrome nail polishes, so I almost skipped this month's box. My maven style is "Classic With A Twist", but for the past couple of months, I haven't been particularly fond of the shades picked for that box. This month I changed my style again and went with "American Beauty". I fell in love with Dakota's rose gold and Stefani's gold flecked grey. And the nail polish remover with the pump dispenser is so teeny and cute...and PINK! What a great design! Hello all! I have another review for you guys and today I want to touch upon Sally Hansen's Magnetic Nail Color. Influenster sent me a box loaded with deluxe and full sized samples to review and this new nail polish was one of the items. I received my Influenster Summer Beauty Voxbox about a week before Fourth of July and receiving this polish inspired me to create a patriotic nail look. This is what I came up with! Quick Take: I thought the color I received "Iconic Indigo" was beautiful and I couldn't wait to try it! Usage Tips: I felt that I had to move pretty quickly. You need to hold the magnet (which by the way, is intelligently placed on the top lid that is not connected to the brush) on top of the fresh paint to ensure proper magnetization. If you don't hold the magnet above the nail directly after it's painted, the lines will not form evenly or at all (because it will dry and set and then it's not malleable anymore). 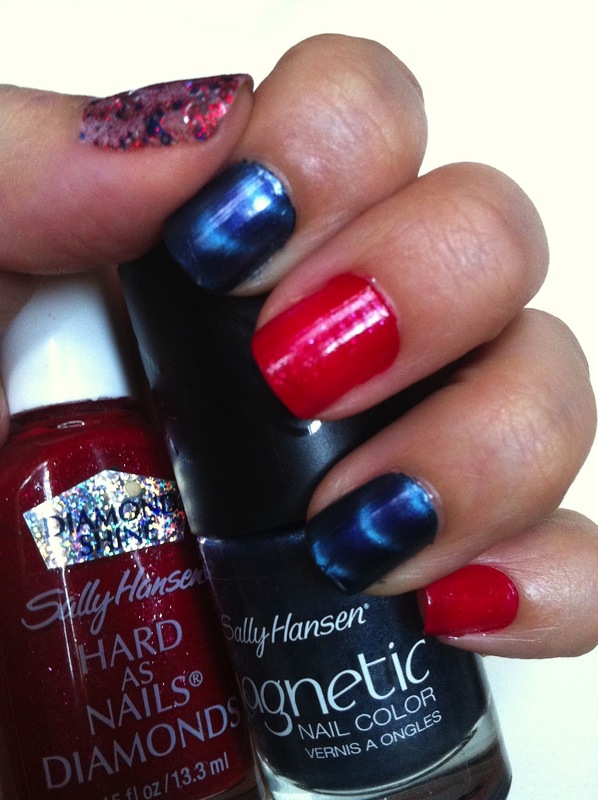 The Verdict: This polish was perfect for creating effortless Fourth of July stripes without all the hassle! I loved how smoothly the coat of paint went on and the magnetic effect was very intriguing. The polish dried pretty quick and the results are so fun! 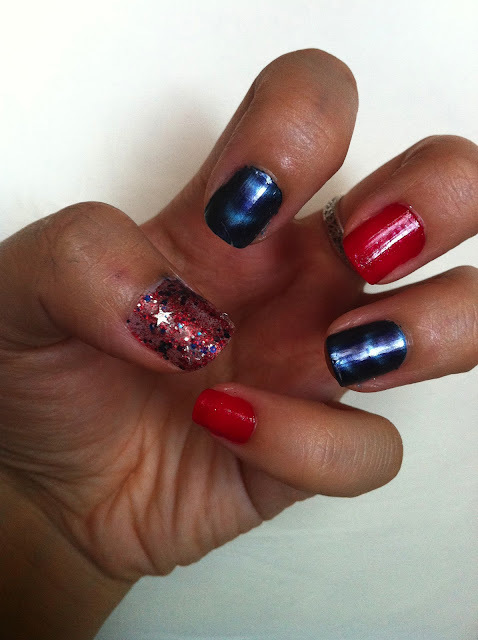 Like, c'mon how cute were my nails for the Fourth?! I loved them. This products is definitely a must try for people who want fantastically bold and fresh nails. I hope everyone has been having a fab week. My week has been super cray and exhausting but getting my monthly shipments from Glossybox and Julep definitely perked me up. 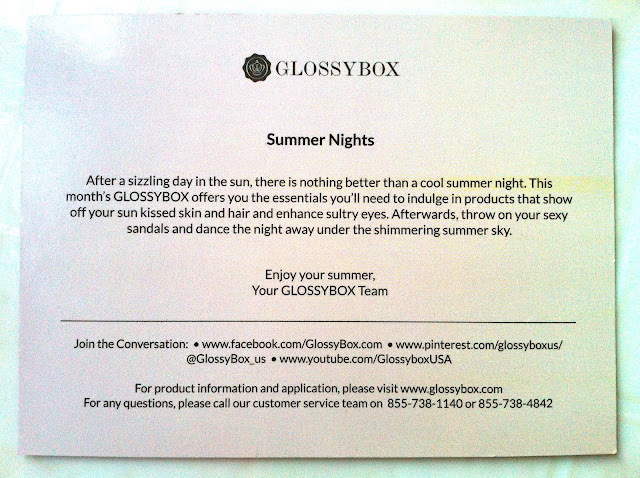 In this post, I want to review the products that I got from Glossybox this month. As stated in the video, I was not particularly impressed with last month's box, but I'm diggin' the products I got for this month. 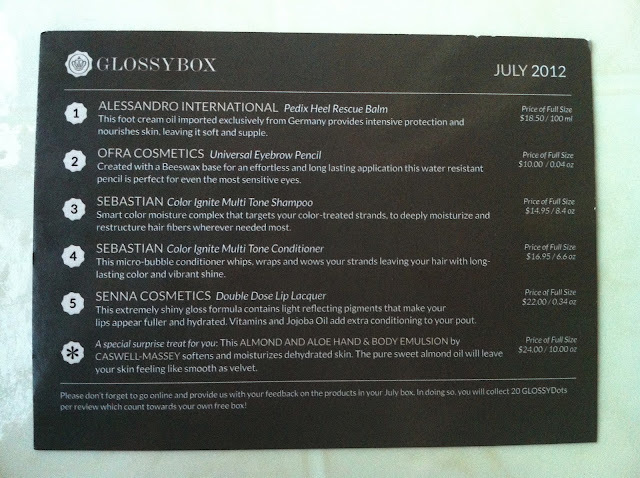 Below, I posted my YouTube unboxing video and included an itemized listing of the products mentioned with the photos. I also took the time to calculate how much this box is worth...scroll down to find out!